Globally, bat populations are declining. Habitat destruction and modification, climate change, pesticides and pollution, disease and human development cumulatively contribute to population impacts. Despite these impacts, historical myths and misconceptions strongly influence present-day public perception. Bats are intrinsic to healthy ecosystems, community integrity and vital ecological processes; yet, bats remain among the most neglected and misunderstood animals. 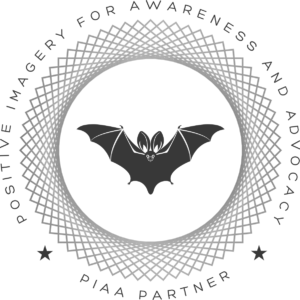 Bat conservation and advocacy necessitates public cooperation and support. People are responsive to mainstream mediascape; and irrespective of accuracy or legitimacy, media portrayal undeniably contributes to public perception. Thus, bat proponents have a social mandate to foster positive public perception, awareness and education relative to North American bats. I recognize that any actions to sensationalize1, fear monger2, “shockvertise3″ and/or employ disinformation4 are inappropriate, harmful and unacceptable. I vow to exercise leadership within my community and throughout society by exemplifying ways to promote positive public perception of bats. I understand the influential nature of mediascape5 and vow to employ media content that reflects my commitment to animal welfare and social responsibility.6 I understand that inappropriate media includes, but is not limited to; i. aversive or threatening images (e.g., bats with mouth open and teeth bared), ii. media with improper, inhumane or contentious capture and/or handling practices (e.g., bats being held by wing membrane), and iii. socially irresponsible handling practices (i.e., bats being held without proper PPE). I consent to public commitment and understand that my representative name (personal and/or affiliation) will appear on the participant database @ fightwns.org/piaa-partners/. I consent to periodic overviews to verify my observance of and respective commitment to this mission and all existing and future PIAA partners. As a PIAA partner, I am a de facto ambassador for North American bats. As such, I vow to contribute to the public education, appreciation and conservation of bat populations. I understand that this commitment relies on the collective commitments of its partners. By signing this document, I acknowledge that partnership implies a three-way commitment from partners individually, partners collectively and the initiative as a whole. Respect underpins the foundation of conservation and preservation of our endemic wildlife species. Others will follow my example if I communicate my knowledge and altruism through my actions and by sharing the PIAA Partners Commitment Pledge.